Bentgo Kids is an innovative bento-style lunch box designed for kids on the go. No other children's lunch box makes it this fun and easy to add variety to lunch. 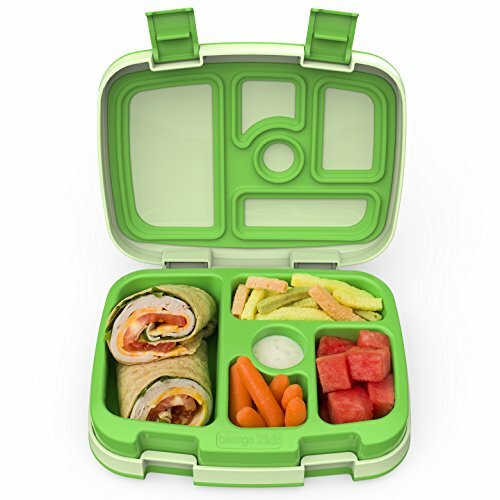 With a compartment for fruit, veggies, dip, an entrée, and dessert, this leak-proof lunch box organically inspires parents to pack a more wholesome, balanced lunch for their children. We spared no detail in the design of Bentgo Kids because we know it's never too early to start building healthy eating habits. Bentgo Kids is recommended for children ages 3-7, but is also great for anyone else looking for a portion-controlled lunch box. PORTIONED FOR KIDS: 5 practical compartments portioned perfectly for a child's appetite (recommended for ages 3-7). Plus, drop-proof, rubber-coated edges and a sturdy design for active kids. LEAK-PROOF TECHNOLOGY: Keeps meals and snacks fresh and mess-free during transport- Includes two kid-friendly latches that are easy for small hands to open and close. PURCHASE WITH A PURPOSE: Bentgo is a proud supporter of Feed the Children, a 501(c)(3) nonprofit organization that provides hope and resources for children and families who do not have enough food to eat. We have committed to donating a minimum of $100,000 through 2018 to help put an end to hunger. WHAT YOU GET: Bentgo Kids compartment lunch box, free eBook with 30 kid-friendly recipes and meal ideas, user manual, industry-leading 2 Year Warranty, and caring customer support. If you have any questions about this product by Bentgo, contact us by completing and submitting the form below. If you are looking for a specif part number, please include it with your message.